Summer not only means longer days and warmer temperatures, it signals the beginning of a new wedding season. While having your wedding throughout the spring has its own unique benefits, there are many reasons why you may be interested in having your wedding during the summer. If you are looking to make the most of your event, here are some summer wedding ideas to enhance your special day. If you are looking for beautiful flowers that have recently bloomed or want to take advantage of seasonal produce to include in your wedding catering, summer is the perfect season. Summer provides many beautiful flowers such as marigolds or yarrows, that can be incorporated into your wedding décor. Looking for even more exciting ideas? Try to incorporate your favorite seasonal produce into cocktails. While you will likely have your wedding reception indoors to beat the heat, if you aren’t planning a prolonged wedding ceremony, there are many reasons for you celebrate outdoors. The weather in the summer, although hot at times, provides a beautiful experience for a memorable wedding. However, it is important to ensure your guests and wedding party have shade to avoid heat exhaustion or dehydration. If you are looking for summer wedding ideas to make your special day unique, consider adding a special snack to your plans throughout the day. For instance, if you want to beat the heat, you may consider having a DIY ice cream bar or freeze pop bar. 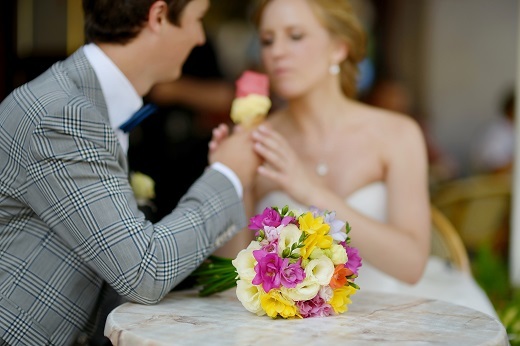 Depending on the tone your wedding takes, look for fun ways to cool down guests and incorporate them into your day.